At the end of 1974, after three years of court battles and acrimony, the final dissolution of The Beatles was about to happen. The meeting was scheduled for December 19 at New York’s Plaza Hotel – ironically, this was the first place the group stayed in America in 1964. George Harrison was in New York on his Dark Horse tour. Paul and Linda McCartney came in, and of course John and I were already in the city. 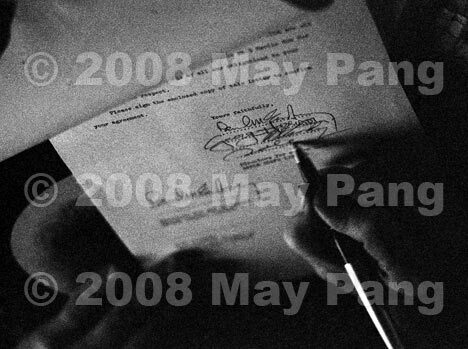 Only Ringo was missing, but he had signed the documents in England. Julian was with us for the Christmas holiday and all was calm, all was bright. John was even planning to join George on stage during his concert at Madison Square Garden. Gathered around a huge table were George, his lawyer and business manager; the McCartneys, with Paul’s in-laws and lawyers; Ringo’s lawyer and business manager; Neil Aspinall, of Apple, with two sets of company lawyers (one for America and one for Britain); and John’s lawyer Harold Seider and his team. “Good question,” replied Harold. Harold left the room to call John, who wouldn’t come to the phone. I was with John and it was up to me to tell Harold he had decided not to attend the meeting. Although John was concerned with shouldering a major tax burden because he lived in the United States, I could sense there was a bit more on his mind. His official reason for not showing was ‘the stars aren’t right’. George, already in a dour mood because his tour was getting poor reviews, went ballistic. He started yelling at Harold, as did all the other lawyers in the room. Then George picked up the phone and called John. I answered and asked if he wanted John, but he barked, “No! Just tell him whatever his problem is, I started this tour on my own and I’ll end it on my own!” before slamming down the receiver. John was listening over my shoulder. We did go to the party at the Hippopotamus Club, where George, John, and Paul all hugged. John, Julian and I left New York the following day to spend Christmas in Florida. On December 29, 1974, the voluminous documents were brought down to John in Florida by one of Apple’s lawyers. “Take out your camera,” he joked to me. Then he called Harold to go over some final points. When John hung up the phone, he looked wistfully out the window. I could almost see him replaying the entire Beatles experience in his mind. He finally picked up his pen and, in the unlikely backdrop of the Polynesian Village Hotel at Disney World, ended the greatest rock ‘n’ roll band in history by simply scrawling John Lennon at the bottom of the page. This entry was posted in Disney World, Gothic Disney and tagged Beatles, John Lennon, Walt Disney World Resort. Bookmark the permalink.